Aesthetica Magazine Blog: Review:Dissipated and Isolated Neighbourhoods: Sterile Environment, Catalyst Arts, Belfast. The gallery’s exterior wall has been appropriated by the artist, Eoin McGinn. A graphic, black and white illustration of futuristic buildings has been painted onto the red brickwork serving as a reminder that Catalyst’s building itself was once ear marked for demolition. The text Dreamed of Places accompanies the mural, imitating phrases used by estate agents to advertise their townhouses and apartments. Inside the gallery McGinn continues this theme of a utopian ideal with a large screen print entitled Urbanisation. Contained within a grid-like sphere the artist has layered a series of outlined buildings synonymous with Belfast. This tightly packed display echoes the ceaseless and repetitive nature of ubiquitous urban development. How does urban development evolve? A starting point might be to take the template of a metropolitan city such as New York or London and attempt to impose standardised forms through so-called regeneration. 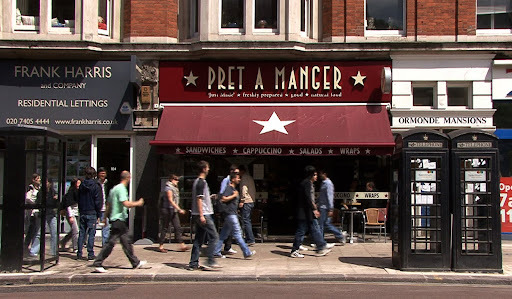 Michael Pinsky evaluates this replication of one city based on another, with his engaging video The Endless High Street version 1: Pret-a-Manger. The video documents the facades of buildings accommodating a chain of coffee houses throughout London. We are shown a different city and yet it feels very similar to the one that we are in. Pinsky cleverly forces us to reflect upon the effects that multinational corporations are having on our decisions as consumers. The consequences are ultimately the sacrifice to individual choice, the conglomerate chains associated with a free market bind rather than liberate. 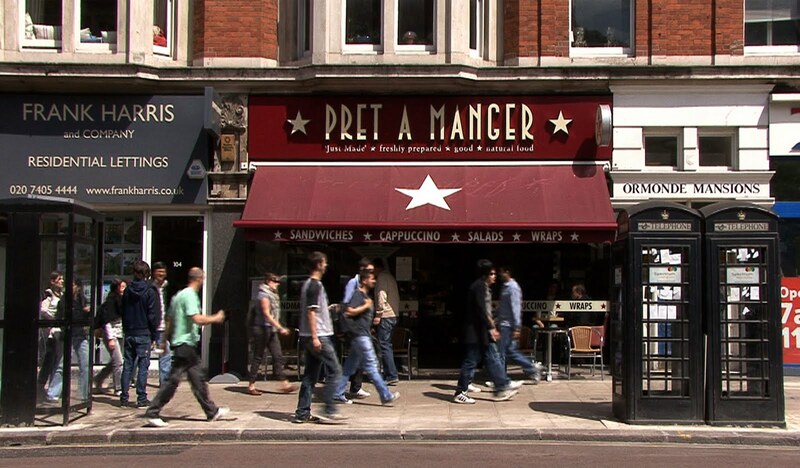 As the video overlays speed up, the Pret-A-Manger sign stays fixed, subconsciously hypnotizing the viewer. Pinsky asks: are we simply being brainwashed by these large companies? The work affects you on a visceral level as you realise that you have been seduced by the allure of the corporation. The collaborative group Forum For Alternative Belfast seek to effect change to Belfast’s built environment. They present a number of maps of the city dating from the 1930s to present day which reveal the transformation urban development has had on neighbourhoods, mostly dissipation and isolation. The aerial views provide a powerful visual topography by which to chart, question and confront decisions made by Belfast’s town planners. More specific areas of Belfast are identified by artists Andrew Dodds and Aideen Doran. Within Spitting Distance is a large black and white poster of a group of punks photographed in the Cornmarket area of the city centre circa 1980. Despite the town-planners attempts to dissuade public gatherings, generations of young people have habitually congregated there and still do. It is this unsanctioned act of ownership by non-consumers that Dodds finds interesting. Aideen Doran draws our attention to the once notorious Divis Flats Complex. In, Homes for Today & Tomorrow the artist projects a haunting video piece onto a make shift wooden structure mimicking an advertising hoarding. The found footage of the Divis Flats Complex has an ethereal quality to it. The images of the towers and surrounding buildings appear like water colours in alluring tones of pastel blue and faded shades of yellow. The prospect of utopia lingers in the glowing slow-motion images suggesting that time had not yet eroded the Modernist architect’s faith in progress. Doran presents her work as an unsentimental reminder that one man’s metropolitan dream can become a communal nightmare. Positioned in the centre of the gallery is a large wooden beam structure made from building-site materials. Keith Winter‘s sculptural installation entitled balls2thewalls has an impressive quality to it. The structure stands as a testament to the endless number of hoardings and partitions that have blighted Belfast’s cityscape over the past ten years. The cardboard panels at the top of the sculpture have a geometric pattern that is similar to the facades built in the 1960s and the 1970s. Two of the panels below are covered with tarpaulin and the adjacent glass panel has been smashed, seemingly by a small geometric sculpture. The implication seems to be that the systems based underpinning of modern architecture has within it the seeds of its own destruction. The urge to revolt against imposed forms, whether social or political is a constant of human existence and this work captures the zeitgeist of capitalist collapse and regime change. A sense of destruction is also prevalent in the work of Sinead Bhreathnach-Cashell’s performance and sculpture installation Builder Bowling. Housing market investors are parodied by the artist, as she invites the audience to bowl with a wrecking ball and strike down her small plaster sculptures that are based on townhouses and listed buildings in Belfast. This is a game with consequences for this city and others like it. Are we to lose Belfast’s built heritage to the onslaught of neo-Italian townhouses, shiny glass office blocks and conglomerate coffee bars? Sterile Environment is consistent in quality as it informs, questions, and considers an issue which could be applied to any European city at the present time. Sterile Environment continues until 23 June.